Modern societies rely on vast numbers of trusted services in such diverse fields as infrastructure, transportation or the financial markets. Most of these services rely on computer-based information systems, composed of stationary as well as an increasing number of mobile devices. All of these devices are required to assure security, dependability and trust for their prospective users. However, a growing number of increasingly refined higher-order fault attacks (FA) aim at extracting sensitive information from these systems. Furthermore, the technological trends towards high-level integration come at the cost of increased susceptibility to random faults. For this reason, gradually more complex fault detection and recovery mechanisms have to be integrated also into mobile trusted devices. Especially for mobile devices operating on limited power budgets (e.g., battery powered or energy harvesting devices), a trade-off between the effectiveness and the power consumption impact of fault attack detection / recovery mechanisms has to be found. Trusted systems hardware and software developers are still lacking effective development methodologies and tools for exploring this trade-off. Cost and time-to-market pressure are economical drivers for establishing development methodologies and tools that ensure short design cycles. The constantly increasing complexity of mobile trusted devices in recent years further increases the development effort. 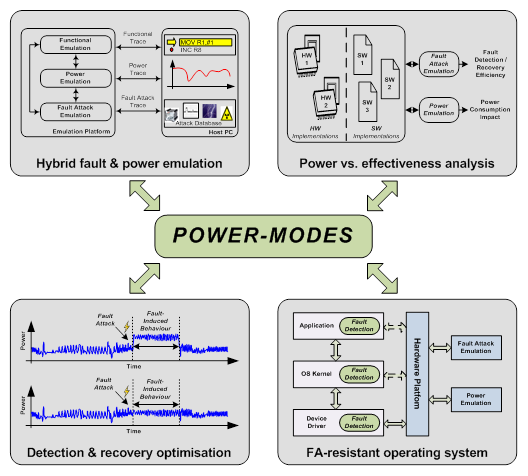 The goal of the POWER-MODES project is to provide key innovations in hybrid fault attack and power emulation: (1) Integration of higher-order fault attack emulation and power emulation approach alongside state-of-the art functional emulation to enable rapid fault attack-aware and power-aware trusted system development, (2) power-effectiveness analysis and optimization of fault attack detection and recovery techniques in the development process of the trusted system, and (3) development, implementation and fabrication of fault attack resistant operating system for RF-powered smart cards. It is expected that the proposed approach dramatically increases the possibilities for fault attack- and power-aware development compared to existing commercial solutions. Furthermore, the overhead introduced by the joint fault attack and power emulation approach is likely to be compensated by the added value of the tool chain. For trusted systems hardware and software developers, effective tools to quickly evaluate power-efficiency trade-offs of various fault detection and recovery mechanisms are missing. Simulation-based approaches for complex systems consume vast amounts of execution time, rendering quick design decisions at early design stages. Functional emulation, built upon FPGAs, is a well known technique for speeding-up the functional verification of software for a given target device before its physical implementation is available. For accelerating the verification of power requirements, the power emulation paradigm has recently been introduced in the FIT-IT funded POWERHOUSE project. However, strong limitations exist regarding the quick analysis of the effectiveness of fault attack countermeasures and fault detection mechanisms and their impact on the total power consumption of the system. The analysis and optimization of fault detection and recovery mechanisms, especially considering the power consumption metric, is therefore usually limited to very small design spaces. From an economic point of view, cost and time-to-market pressure are additional reasons for introducing tools. 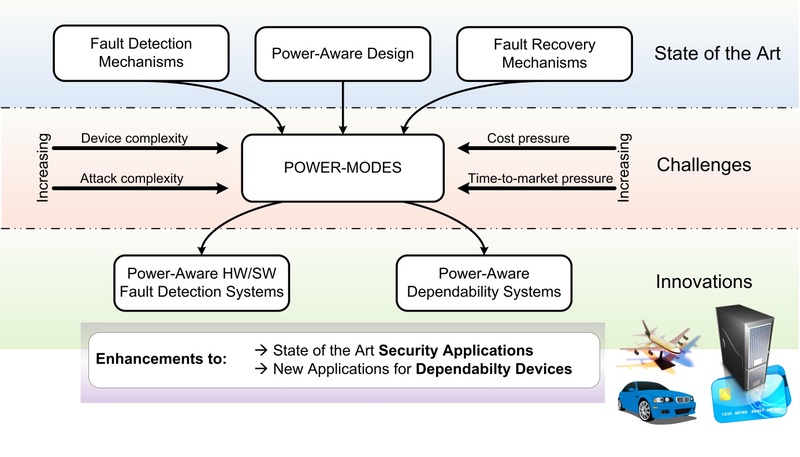 The goal of the POWER-MODES project is to provide key innovations in hybrid fault attack and power emulation: (1) Integration of higher-order fault attack emulation and power emulation approach alongside state-of-the art functional emulation to enable rapid fault attack-aware and power-aware trusted system development, (2) power-effectiveness analysis and optimization of fault attack detection and recovery techniques in the development process of the trusted system, and (3) development, implementation and fabrication of fault attack – resistant operating system for RF-powered smart cards. It is expected that the proposed approach dramatically increases the possibilities for fault attack- and power-aware development compared to existing commercial solutions. Furthermore, the overhead introduced by the joint fault attack and power emulation approach is likely to be compensated by the added value of the tool chain. The hybrid higher-order fault attack and power emulation approach combines the benefits of several traditional development processes for secure and dependable embedded systems. Figure 2 outlines multiple aspects of the trusted systems development process that are covered by the POWER-MODES approach. The figure also outlines the claim of the project to develop a concept that can be applied widely and is not restricted to a specific emulator or software development environment. The integration of the fault attack emulation into the functional and power emulation approach (developed in the currently ongoing POWER-HOUSE project) enables the investigation of the power impact of fault attacks on a given system. Furthermore, the increased power cost for fault attack detection and recovery mechanisms allows for power-efficiency trade-off decisions. State-of-the-art and novel fault attack detection and recovery SW and HW techniques are analyzed for their effectiveness and their impact on the power consumption. A power-effectiveness comparison, aiding designers in choosing the optimal technique under the given requirements (e.g., fault detection rates and battery lifetime requirements), is being created. The integration of an operating system development into the POWER-MODES project ensures the evaluation of the developed methodologies and techniques. The project benefits from the direct feedback of the software developers employing these methodologies and techniques. Furthermore, the fault attack-resistant operating system serves as proof-of-concept.